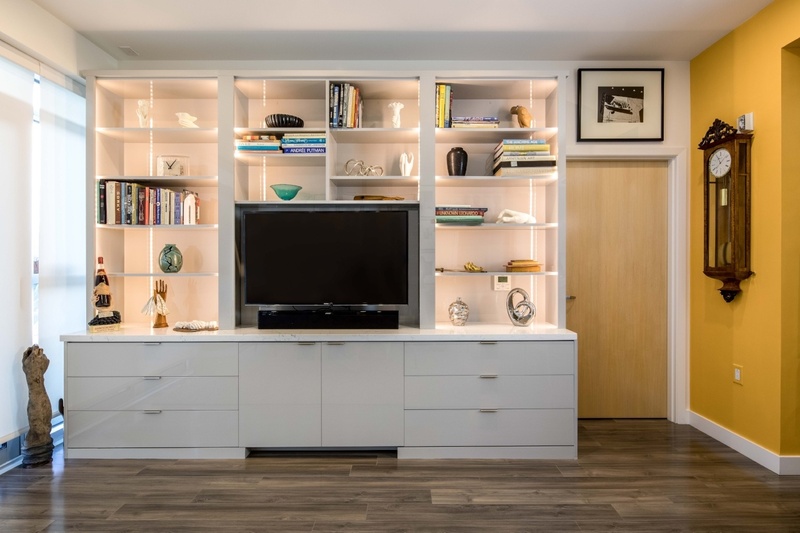 With so much new construction going on in the Bay Area, more people are getting the that special opportunity of creating custom organization solutions throughout their home from the very beginning. 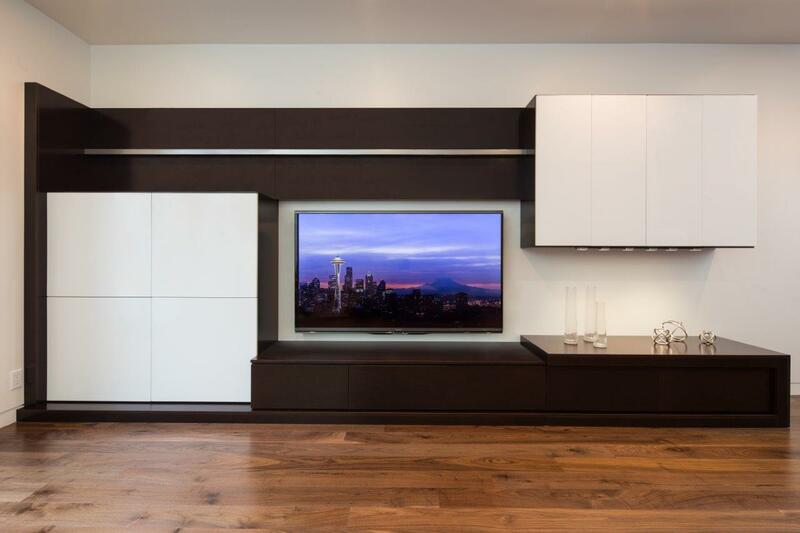 Valet Custom Cabinets & Closets is delighted to partner general contractors, architects, and interior designers to give these homeowners exactly what they want and need in their brand-new home. Whether we create organizing solutions for one room or throughout the house, Valet Custom does more than cabinets and closets. We help you organize your life. Super Bowl season is coming up fast. The final ten teams have emerged, and although the Raiders aren’t going to feature in the playoffs (too soon? ), there are still a lot of fantastic games in store for football fans. 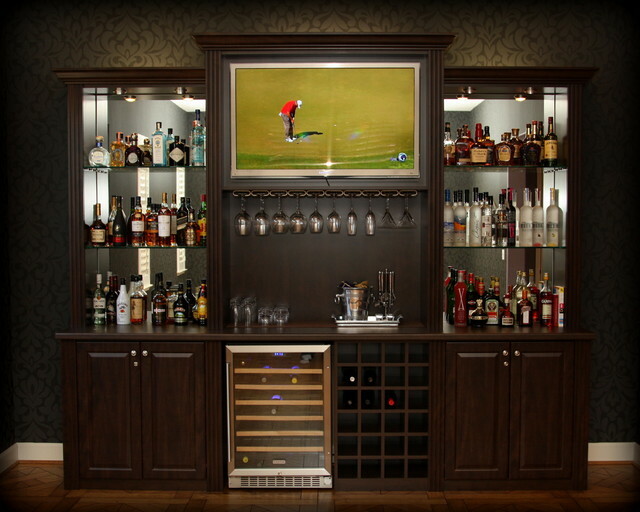 If you’re of a mind to entertain at home, a custom-designed man cave complete with entertainment center, built-in bar, and all the bells and whistles will be just the place to watch the games unfold. There’s nothing like having family home for the holidays to make you really notice all the home improvement projects you never quite got around to this year. Between crazy road work on Tassajara (which is finally ending) and the massive fire scare the area endured this year, it may have been difficult to find the motivation to get larger projects started. 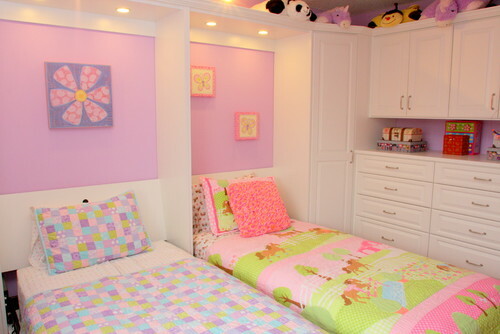 However, the holidays are the perfect time to step back and take a look at how your family uses your space, and dream up ways it can be improved. In Danville, “family-friendly” is the name of the game. Between pre-preschool performances at the Village Theatre, a playground that integrates local history, and a tree-lighting ceremony during the holidays, it’s a pretty great place to grow up. In 2010, 38% of households in Danville were families with children under 18, and though it’s hard to say which came first—the kids or the kid-friendly amenities—it’s clear that the city of Danville understands that learning and play are a big part of child development. If you’re a long-time Bay Area hoops fan like me, you definitely know the name Steph Curry, the star point guard for our Golden State Warriors. But did you know that until May, Steph Curry owned a home in Orinda? Although he recently sold it for $4.65 million, he used to live in a Spanish-style hacienda rich with luxuries—including 4,700 square feet of interior space. But with the average listing price for a single family home in Orinda half of what Steph Curry’s house was worth, most folks in town don’t have the same kind of space. A lot of the country sees Bay Area residents as tech-savvy nerds. And that’s often true. But we’re also huge sports fans. I can’t go into any client’s house without getting into a conversation about whether the Giants will continue their even-year streak, the Sharks will get into the Finals, the A’s will rebuild, the 49ers will get back to the playoffs, or, of course, whether the Warriors will even lose a game next year. It was an exciting year for the Golden State Warriors (and the Sharks), even if we did come up short at the end. And it’s still a great time to be a Bay Area sports fan. We can keep rooting for the San Francisco Giants, and we’ve been lucky enough to have great teams across the board (Okay, football hasn’t been a strength lately, but the Raiders and 49ers are young teams with lots of potential). Saratoga is nestled in the heart of the booming Silicon Valley, but it still has a charming, small-town feel. Nature abounds—how many cities have redwood forest within their borders? It’s no wonder so many people are attracted to the area. It’s one of America’s most educated towns, and one with the highest-earning citizens. And what do those citizens do when they aren’t shopping in boutiques or eating at world-class restaurants? They entertain. As a Silicon Valley hotspot, Saratoga is home to tech professionals who understand the value of virtual social networks—but also real ones. And as a host, you want your home to wow your guests. 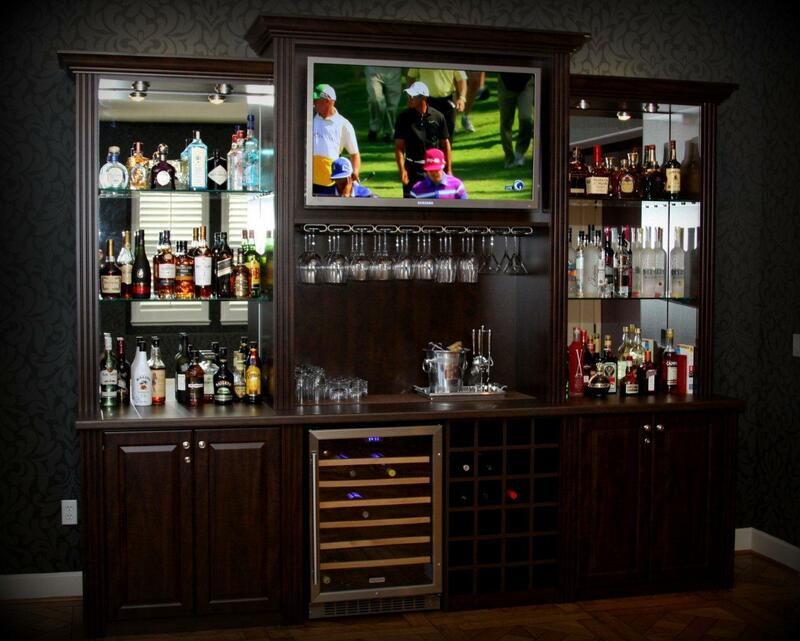 A custom-designed bar and media center lets you combine luxury and spatial efficiency in any space, whether a confined alcove or a large wall expanse. 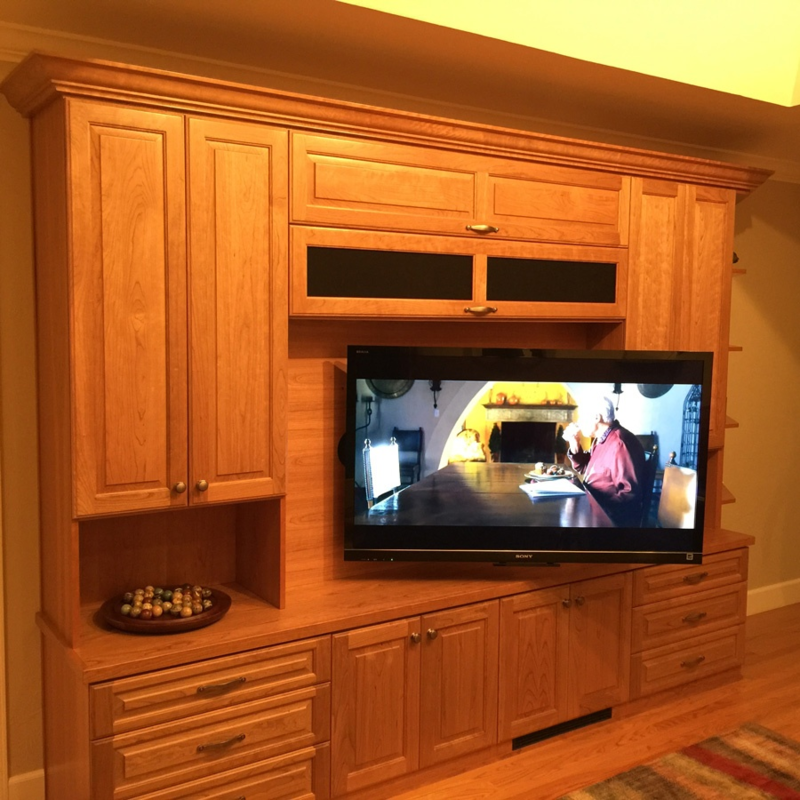 A modern, elegant media center uses premium wood veneer in midnight ash to hide speakers and other equipment and to provide storage. Driving around in Pleasanton, you notice a few things. First of all, it's a great place for families, as all the people leisurely walking down Main Street let us know. USA Today even says it is the 4th-best place to live in the country (though residents might question why it’s not first). The second thing you notice is that construction of new houses is a booming business. Pleasanton homes tend to be roomy, with 3-and-4 bedroom homes having more square footage than the national average. Houses that size need a center, a focal point for family and friends. For many, and especially for families in Pleasanton, that choice is the room with the media center. It’s where you gather to watch TV, and where the kids can play video games, or watch a documentary that helps them with their homework. It’s a room that’s going to get a lot of use, and it’s important to get it right. 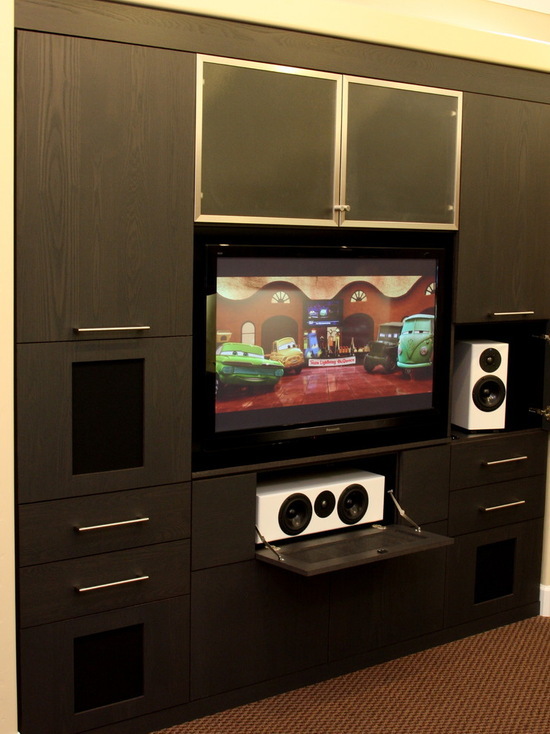 Given that media alcoves in newly constructed homes range from 48-96” wide, finding furniture pieces to fit properly can be difficult, even if the space is already fully wired for power, internet and television. 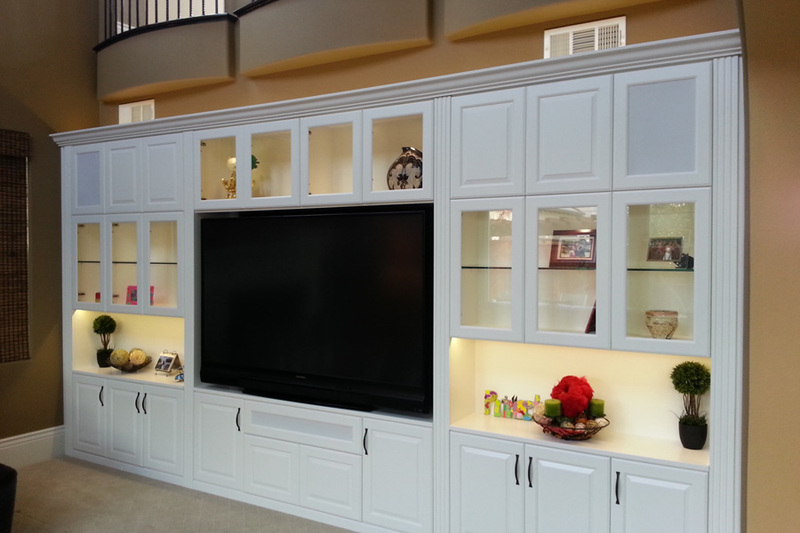 That makes custom cabinetry the perfect solution.